Are you blessed or hard working? Several years ago my editor at the time got a very nice job. The kind people dream of. She was the new travel writer for a major newspaper. Basically, get paid to travel the world and write about it. Nice, right? “You are so lucky,” I said in a congratulatory way. She proceeded to scold me. Luck, she said, had nothing to do with it. She had worked hard for many years to land this job. I quickly realized she was so right. Attributing her achievement to luck downplayed years of hard work, even if I didn’t mean to do that. I resolved to never again tell someone they were lucky, but since becoming pregnant the first time, I have heard the word “lucky”, or its holier partner “blessed”, to describe my life way too often. Sometimes I even say it to myself. I am aware that in life some people are more fortunate than others, or blessed if that is how you feel about it. Among other things, I feel incredibly fortunate to have been able to conceive and bear children, and I am incredibly grateful for my family’s health. I know what it is to have a loved one who is ill, and it is not easy. But for other things, I feel responsible for what my life is like, for better or worse. As women, we often see our achievements as being mostly the work of luck, or maybe we just say that to appear more amicable, or to conform to gender stereotypes. In any case, we are not helping ourselves or others by saying this, as if regardless of what we do in life, it all comes down to luck or divine favor. There are so many things I don’t think you can attribute just to luck, fortune or godly intervention. I’ve been told that I am lucky to nurse. I am aware that there are women who just can’t produce enough milk, or have adopted their children or need medication that prevents them from safely nursing, but telling me that I am lucky makes it as if sacrifice, committment, time and even breastfeeding through pain have nothing to do with my success in breastfeeding. 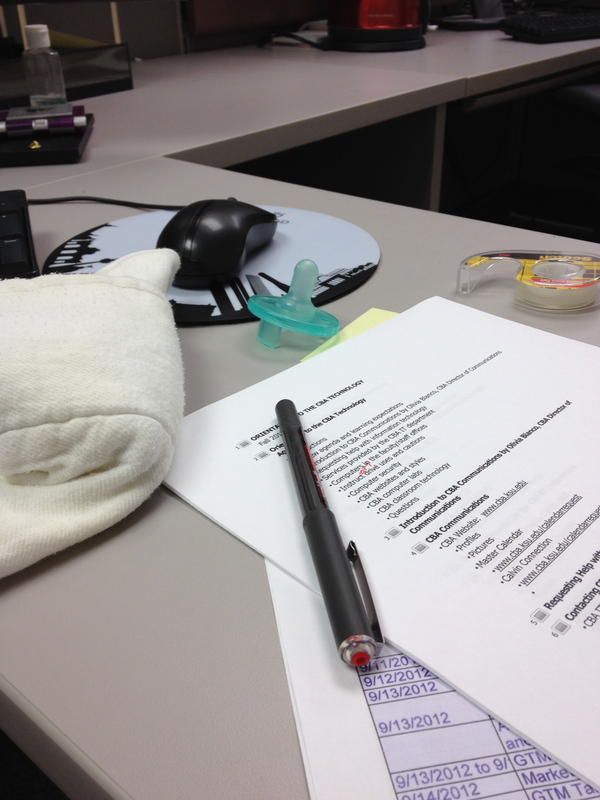 A workplace that allows you to bring your infant is great, but it is not just luck that makes that your benefit. I’ve also been told that I am lucky my kids are good sleepers. One is, but the other one wasn’t always. It took many months and a lot of patience, commitment and adjusting plans to set a consistent schedule that he now expects and thrives in. I took 13 weeks of maternity leave, and again I was told I was lucky to take it. What people didn’t see was that I had saved all of my vacation and sick days as well as saved extra money from every pay check from the day I found out I was pregnant just so that I could afford staying home all that long. Maternity leave at my job then was not paid. In my daily life I see many women who have great things going for them. Some of these are superficial, like perfect hair and make up despite their three kids in tow. Others more important, like a group of good friends. I am still tempted to think they are lucky, and I know they will probably say this too, but what I don’t see is the early morning routine that it takes to be a well put-together mom, and the work that it takes to be a good friend, including putting yourself out there to make friends in the first place. I hope that as you read this you don’t think that I am ungrateful for what I have, because I am not. I am incredibly aware of how my parents helped me because they appreciated a good education and worked very hard to give me one. They put me in a very good place to make something of myself. There have been many others along the way who have helped me in my personal and professional lives as well, including my sister and brother in law, my in-laws, editors and other former bosses and colleagues, as well as many friends who have made my life better just existing. You could say I have been lucky, or blessed, this way. However, downplaying my own sacrifice and hard work, as well as not realizing how mistakes and less than stellar work have affected my life doesn’t help me in any way. It also doesn’t help the women around me. How will my daughter learn about hard work if I attribute a good job to just luck? It is a shame that as women we seem to feel the need to downplay our achievements. I think this is why so many women feel envious of others and judge them. If everything that is good in their life is sheer luck, well, we could be jealous. If we acknowledge how long and hard it took someone to get where they are now, we may think twice about judging. So next time you feel the need to count your blessings, or appreciate your luck, please do so, but also acknowledge that at least part of the reason you are succeeding in life is because you work hard. Feel free to acknowledge others’ hard work as well. Do you tend to downplay your hard work? Why do you think this is? I’d love to read about your experience. I think many events in life are a combination of luck and hard work… sometimes the reality is you were just in the right place at the right time. Yes, there is a combination, for sure. But in order to be able to take advantage of opportunity you need to have worked hard or be willing to work hard to make it happen. I personally have been at the right place at the right time and for one reason or another not taken fully advantage of the opportunity. That is all me, not back luck. Thanks for reading and for your comment! So true… Women try to be inclusive and generally nicer… I for one am trying to be appreciative but include myself in that list as well. It’s hard and not easy but trying to follow anyway. I like being nice and inclusive, but there really should be a limit to this. We can’t constantly put ourselves down for the sake of being nice, if not for ourselves, then for our kids.